Not understanding the Global Islamic Movement and what drives its actions is the reason America lost the wars in Iraq and Afghanistan. Since 9/11, military generals, Presidents, National Security Advisors, Members of Congress, and others have been too busy to stop and actually do what the law and their Oath of Office require them to do – know all enemies or do due diligence to know all enemies. You cannot “protect and defend against all enemies, foreign and domestic” if you do not do this. When this event is viewed from the perspective of the Islam, the United States submitted to the objectives of the Global Islamic Movement in this current phase of their efforts. In order to understand the magnitude of this, the language used in this summit must be understood the way the muslim world understands it through the filter of sharia – which is the only source through which Islamic leaders understand anything. The Cairo Declaration was officially served to the UN by the OIC in 1993. This means the entire world was put on notice in 1993 that when leaders of the muslim world use the phrase “Human Rights” they mean “the imposition of sharia law,” and sharia is the only filter through which they understand the language they use when discussing any issues. When muslim leaders use words, those words must be understood as they are defined in Islam, not as they are understood in the West. “Terrorism” is defined in Islam as “killing a muslim without right.” Under sharia muslims may be killed if they apostasize from Islam, kill another muslim without right, or if they violate any other law under sharia for which there is a capital crime. Otherwise, to kill a muslim is to be a “terrorist.” “Extremism” in Islam is to exceed ones ability – to move the Islamic Movement ahead too quickly, thus putting the muslim ummah (global muslim community) in danger because this risks losing muslims who do not understand their duties under sharia and exposing Islam’s true intentions to the non-muslim community thus bringing violence upon muslims – terrorism. Saudi King Salman spoke at the summit yet he sent two messages: one for the muslims and one for the non-muslims. Americans and the rest of the non-muslim world heard the King say he is going to eradicate “terrorists” from the planet and thought he was talking about ISIS and Al Qaeda. The muslim world heard that the United States was providing hundreds of millions of dollars and weapons to support the Islamic world’s effort to destroy anything on the planet that stands in the way of the complete implementation of sharia – a command from Allah in the command and reflected in the words and actions of Islam’s prophet Mohammad. Understanding this necessarily completely changes America’s perspective of what took place in Saudi Arabia last weekend. The President of the United States is being given counsel and advice from U.S. officials who appear to lack any understanding of any of this, which will lead America’s to defeat. Exactly the Islamic world’s objective. 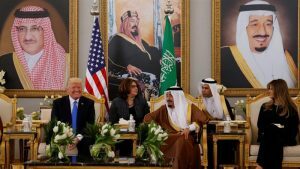 For UTT’s complete analysis of the speeches by King Salman and President Trump please click HERE. Surely post Obama Trump has true expert advisors on the real Islam???? I had assumed US needed some allies against Iran and that this was the diplomatic objective in Trumps visit to Daudi Arabia. He does appear to know that actual Islamic doctrine motivates the terrorism against us and the free world. (Anybody know how to get Dr. Warners diagrams/power point images emailed which had been on offer? Impressove analysis. What is UTT? The extralegal nature of the 9th circuit’s relentless attempt to lipstick a pig in behalf of anarchic impostors seeking to usurp the exclusively-presidential national security vetting authority is predicated now on the definition of “Peace” I.e. a word defined by Islamist jihadists as that period during which every human being on earth is under the draconian control of sharia. And anyone who would assert otherwise to the court, is either an uninformed marginal moron or a nefarious liar. [see: GOVERNMENT EXHIBIT 003-0085/3:04-CR-240G/U.S. v. HLF, et al]. Furthermore, in view of the District Court evidence document cited above, lest we forget, the final report of the 9/11 Commission, issued on 22 July 2004, effectively concluded that the FBI had prior knowledge of the impending September attacks (identified in section-2 as a “Declaration of War”) though rather than sound the alarm and take preventative steps, engaged in the obstruction of justice by denying FBI Special Agents interview-access to the only potential sources of material data known to be accessible on American soil, thus enabling the thirteen (13) Middle-East individuals in question to not only depart Logan Airport in Boston, Massachusetts during an otherwise comprehensive ban of non-U.S. military air traffic in American airspace, as though they were tourists, but to do so with U.S. presidential ad hoc approval. I.e. the Bush Dynasty isn’t comprised of Little Lord Fauntleroy clones. In 1966, for instance, during an interview recorded by Columbia University, the 9/11 president’s grandfather, (who according to archives stored in the Library of Congress had his family assets seized by U.S. authorities under the “Trading with the Enemy Act” of 1941 for doing banking business with the Nazis) recalled his introduction to American politics as a triadic warning, I.e., “claim everything; explain nothing; and deny everything”, then added, with respect to intelligence data, “you have to be willing to do a lot of things furtively and secretly to bring about a situation that will accomplish what you want to have accomplished”. There are 347 internet entries exclusively related to his Union Banking dealings with Adolf Hitler’s Nazi war machine. Too, in 1988 Barron’s Financial Newspaper reported that the 9/11 president’s father, and “George Diaz Serrano”, whose first names in Spanish were both “Jorge”, engaged therefore in “prestanombres” I.e. “name lending” in order to hide the eventual 41st president’s investment in Permargo Oil from the Mexican government and thereby skirt Mexican ownership laws. Barron’s also accused the SEC (Securities & Exchange Commission) of destroying documents relevant to said fraud after the 9/11 president’s father became vice president, which the SEC’s records office attributed to their having been “inadvertently” placed in a file consisting of 1000 boxes slated for pulverization. The What-Who-When-Where-and-How of the 9/11 atrocities per se have long since been added to the annals of American history. And were it not for polygraph & AVATAR (automated virtual agent for truth assessment) mandatory-deposal prohibitions (threaded mainly to the preservation of elitist immunity), the fragile “house of 9/11 cover-up cards” which remains respecting three obvious players and multi-millions of Middle-East dollars in exchange for positions of American political power would cease to exist. In the meantime, section-3 of the 14th amendment to the Constitution reminds us in relevant part that: “no person shall hold any office, civil or military, under the United States, or under any State, who, having previously taken an oath, as an Officer of the United States, or as an executive or judicial official of any State, to support the Constitution of the United States , shall have given aid or comfort to the enemies thereof. But Congress may by a vote of two-thirds of each House, remove such disability”. For the past 20-some years I have been attempting, in my small field of influence, to awaken our country to the dangers of Islam. You folks, here at Understanding The Threat (who I JUST discovered thanks to a radio interview), are doing a MAGNIFICENT job of doing just that! In the future, my efforts will be to promote THIS website. May God richly bless you in your work! My name is Diane and as a former flight attendant for a major carrier here in the US have taken our troops all over the world. I was very active in Operation Iraqi Freedom in 2003 of moving thousands of troops all over the world. Thank God Bush was President at the time. I saw your program on SBN this Saturday morning and want to help to speak in the Church body meaning all whom are Christ believing Church’s I’m so proud of you Mr. Guandolo for speaking” TRUTH” back into America at any cost that is my mission and purpose as well. I would like to take all your classes and present this knowledge to even all police departments as well. I traveled to the middle east a lot and let me be the first to tell all Americans that No Not One Is Our Friend. It is not in any way shape or form a peaceful religion. I really do not like the word religion because all of us Christ Believers know That It is Relationship Not Religion!